At W.S. Safety we strive to provide excellent service in a timely way. In addition to our Rooftop Safety Products, we offer some other industrial safety system products. 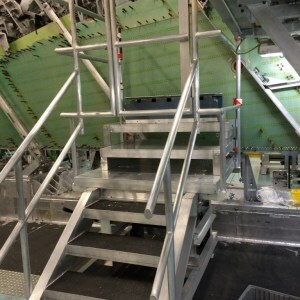 When developing a custom access platform, we work closely with our customers to review their needs and requirements for all sorts of specific details including dimensions, locking casters, unique levelling jacks, custom height rails, and other items, to ensure that the platform meets and exceeds any applicable safety standards as well. 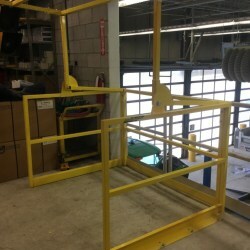 The Mezzanine Safety Gate - Industrial Safety Gates protect employees in elevated mezzanine loading areas. Its counterbalanced gates ensure that one gate is always between your employees and the edge of the platform for passive fall protection. Our Horizontal Mezzanine Gate is a sliding, motorized mezzanine safety gate that can be opened or closed from a safe location as required. SafeMezz360 is the latest fall-protection product for keeping personnel safe during the important, but potentially hazardous, job of loading and unloading fork-lifted materials to and from your mezzanine.